In “What map is this?” Part 1 and Part 2, cartobibliographic resources useful in identification of North Carolina maps were discussed. In this segment, we’ll provide all the nitty-gritty details needed to correctly identify and date a series of 19th century atlas maps of “North & South Carolina” (ignoring the awful grammar inherent to that map title). The 1835 atlas was published by D.S. Stone, N. York, and printed by Cammeyer & Clark, N.Y. 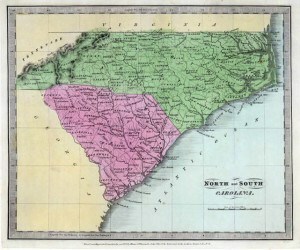 The NC/SC map contained therein has an 1834 Illman and Pilbrow copyright imprint. The second edition of Burr’s atlas was published in 1836 by Wm. Hall & Co. The NC/SC map contained therein has an 1836 Illman and Pilbrow copyright imprint. Subsequent issues of the Universal Atlas in 1840, 1842, 1843, 1844, 1848, and 1849 were attributed to Jeremiah Greenleaf. 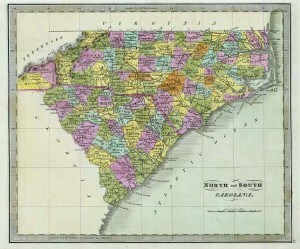 As shown below, the NC/SC map (either Burr or Greenleaf versions) can be found handcolored by state or by county. The following document provides all the particulars (for a wider view, open in a separate tab/window via this link). Caveats: The determination of these four states of the map is based on the copyright imprints and a review of the North Carolina portion of the map. Someone with a keen interest in South Carolina maps should accept the challenge of determining if there are any changes in South Carolina that affect the numbering of states of this map. Additionally, there is an 1849 edition of this atlas in a private collection in Vermont. The NC/SC map in that atlas has not been examined. Corrections and/or additions are greatly appreciated. Please use the “What’s on your mind?” comment box below. Excellent biographical information on David Burr can be found on Barry Ruderman’s web site, specifically, on this web page. This entry was posted in 19th Century, Cartobibliography and tagged cartobibliography, David Burr, David Rumsey, Jeremiah Greenleaf, north carolina maps by crmaps. Bookmark the permalink.